Have you noticed something good this month? Free books. Signed paperback giveaways. And a new, irresistible read from my Veils and Vows series, set in Blueberry Springs. Three great reasons to love September, Veils and Vows, and fun escape reads. Come on! Let’s get swept away in the latest ‘love happens’ romance set in this fun small town that will feel like home. The latest giveaway (watch this blog and Goodreads for one more this month!) 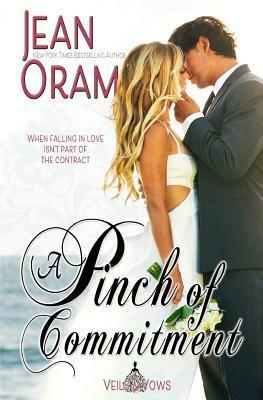 is for a signed paperback copy of A Pinch of Commitment–one of my Veils and Vows favourites. Giveaway is open until October 9th. The second book in NY Times bestselling Jean Oram’s new Veils and Vows series. Irresistible, sweet romances set in the small mountain town of Blueberry Springs. Read them out of order–it’s okay. I promise. Book two from NY Times bestselling Jean Oram & her new Veils and Vows series. Irresistible, sweet romances set in a small town. A Pinch of Commitment is the second book in the Veils and Vows series and it can be read out of series order and as a standalone.